Gleneagles Guest House and Tea Rooms are in a lovely position on Clifftown Parade, Southend, facing across the Thames Estuary. This is the third time we have held a Double Whammy at this location. As always, the hospitality was first class and, yet again, it was a hot sunny day and delegates were able to enjoy the delightful terrace area. Our two beneficiaries for this event were the Mayor’s Charity which is Southend In Sight for this mayoral year, and the South East Essex MS Society. In total we raised £307. See the Double Whammy website for full details of how funds were raised and split between the two charities. 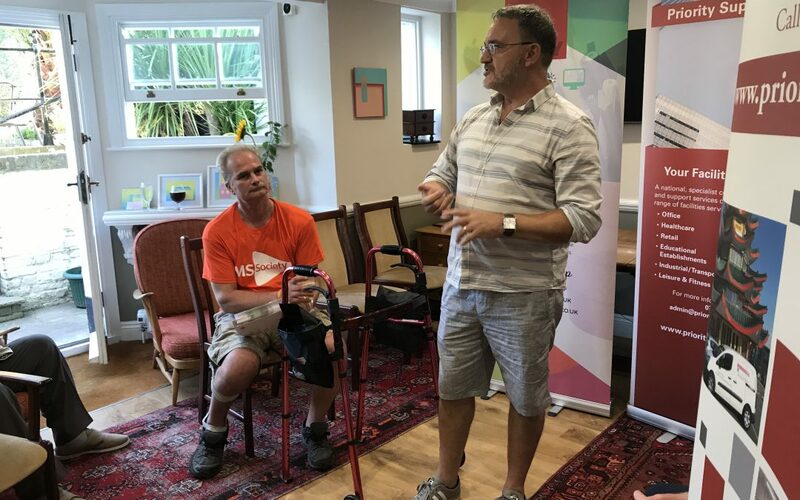 We were delighted that Cllr Derek Jarvis, Mayor of Southend, was able to attend and tell us more about the work of Southend in Sight, previously known as Southend Blind Welfare Organisation. The Mayor also presented a Gold Southend Business & Community Charter Award certificate to Emily Hewett of I am Emily Design & Marketing. Click here [blog link to be added] for more details of the company’s contribution to the local community.